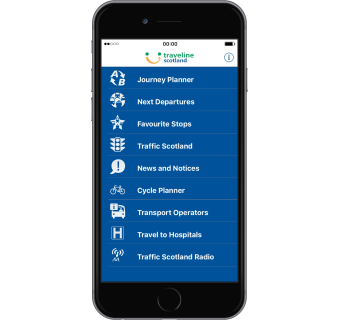 The award-winning Traveline Scotland and Traffic Scotland app provides comprehensive travel information for journeys across Scotland. Our txt2traveline SMS service offers next bus times via text message - useful in areas where there may be limited internet access. Tell your Twitter followers about our app, or share on Facebook. You can also follow Traveline Scotland on Twitter.